Society is increasingly more open to discussing the topics of suicide and mental health. 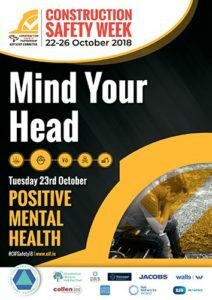 However, to affect a reduction in the number of suicides in Ireland, there is a need to promote further understanding and awareness of suicide and mental health among Irish workers, particularly men. Irish men can be reluctant to discuss their problems and emotions with their colleagues and friends. The latest UNICEF report highlights Ireland as having the fourth highest rate of suicide in Europe. Those at highest risk fall within two age groups, 25-34-year olds and 45-54-year olds, with men three times more likely to commit suicide than women. Early intervention is essential. Hence, there is a need for all to recognise the warning signs of depression and stress in ourselves, in our families, friends and work colleagues. Indicative signs of stress burden or depression may include a perceived lack of interest in life events, an observed personality change, social isolation, lack of interest in physical appearance, excessive indulgence in intoxicants, dramatic weight loss or gain, and noticeable irritability. The workplace is a particularly influential environment, given the large amount of time people spend at work and in the company of their work colleagues. Let’s watch out for ourselves and our colleagues and effectively ‘mind our workers’. The means of achieving and maintaining positive mental health differs from individual to individual. Taking the time to enjoy hobbies and activities of personal interest. Additionally, the CIF is proud to continue a partnership approach with Pieta House (www.pieta.ie). Pieta House provides a free, therapeutic approach for persons in suicidal distress and those who engage in self-harm. Pauline Bergin, psychotherapist with Pieta House, has recorded a webinar specifically for Construction Safety Week 2018. This will be available for viewing on the CIF website from Tuesday, 23rd October.